Article first published as TV Review: BLACK LIGHTNING on Seat42F. If you’re a big fan of the CW’s Arrowverse, a collection of television shows based on DC Comics properties that connect with one another, you may have mixed feelings about new series BLACK LIGHTNING. Although it joins the network with like source material, it is tonally quite different than the other series, and for now at least, it isn’t connected into the bigger picture. But if you just like superhero shows, this one is a fine addition to the genre. BLACK LIGHTNING centers on Jefferson Pierce (Cress Williams, Hart of Dixie), a metahuman who used to fight crime as the titular hero. Nine years ago, urged by his now ex-wife, Lynn (Christine Adams, Agents of S.H.I.E.L.D. ), Jefferson hung up the mantle and focused on making a difference in his troubled community as a high school principal. Now, however, gang violence is on the rise. After his younger daughter, Jennifer (China Anne McCalin, House of Payne), gets pulled into the mess, Jefferson decides to go back to his previous vigilantism. This is much to the delight of Jefferson’s dear friend and helper, tailor Gambi (James Remar, Dexter), who has an upgraded suit ready to go for him. The central gang are known as the 100, headed by Jefferson’s former arch-nemesis, Tobias Whale (Marvin ‘Krondon’ Jones III, Harry’s Law). Whale is a lead character, which indicates something hinted at in the pilot, “The Resurrection” : BLACK LIGHTNING will not a villain-of-the-week procedural. Instead, it is about the environment of one city, with past playing into present, and the situation is more complex that can be boiled down to a sound bite or trailer. We see this most prominently in Jefferson’s friend, William Henderson (Damon Gupton, Criminal Minds). William is a detective on the force who thinks law enforcement should handle the situation. But clearly, the cops aren’t doing enough, as the 100 operate relatively openly. Even Jefferson has been complicit in their activities, working out a truce to keep them out of his school. So as BLACK LIGHTNING jumps back into the fray, the balance will be upset, which will likely give both good guys and bad reasons for concern. This is also very much a family drama. Jefferson wants nothing more than to get back with Lynn. While Lynn pressured Jefferson to give up the crime fighting, when their children are put at risk, she doesn’t raise objection when he does what he has to to bring them home safe. Jennifer is rebellious, but seems to have a good heart. Older daughter, Anissa (Nafessa Williams, Twin Peaks), the more obedient and politically active young adult, will be involved in multiple aspects of her father’s life, revealed in a twist at the end of the hour that comic fans will see coming. So there’s a lot going on here. There will be inevitable comparisons of BLACK LIGHTNING with Marvel’s Luke Cage on Netflix, especially as this series focuses on the larger neighborhood and the past relationships of the characters, making for a similar premise. BLACK LIGHTNING suffers by comparison, not taking its time as much, nor going as deep. But it is a solid series on a non-cable network, which, because of easy access, has the possibility of reaching a different audience. And the lead characters are separate enough in makeup, having some very significant differences, so there’s certainly room for both on the air at the same time. Thankfully, the CW DC shows all go for something a bit different from one another and their competition. 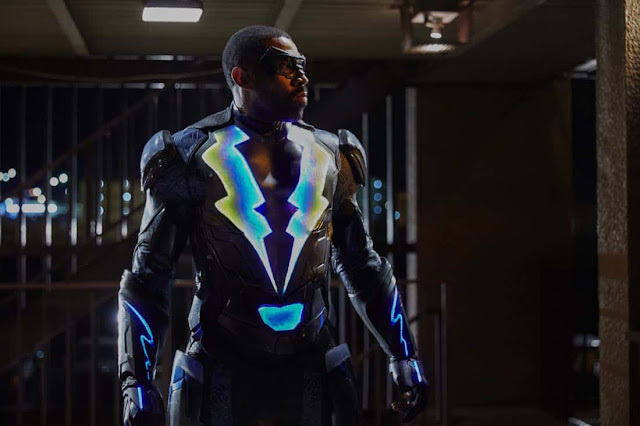 While I love the world building, I think it is smart not to immediately connect BLACK LIGHTNING to the other Arrowverse properties because it is more grounded, more serious than its fellows However, I do hope someday to see the worlds collide, as it’s a cruel tease to fans to have the crossovers so close to reality and not seem them to fruition. If it happens, though, I do hope care is taken to keep Jefferson true to the soul of his own series, and not sanitize him down just to involve him in the larger group.